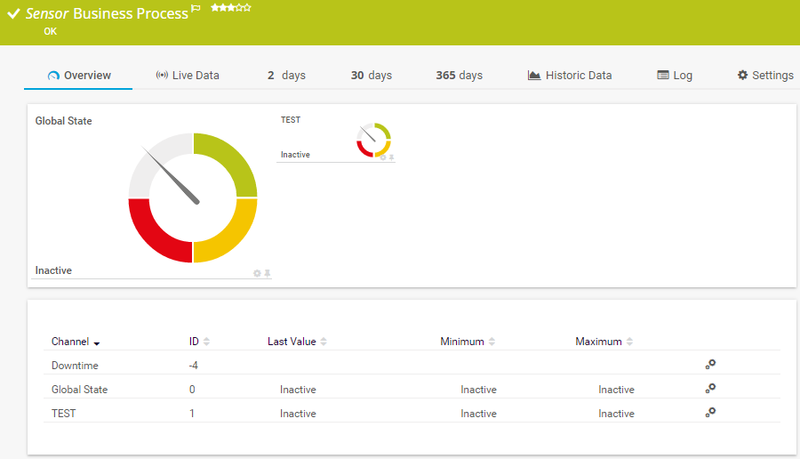 Note: The Business Process sensor does not show values in the "Downtime" channel because they cannot be calculated for this sensor type. Note: If you want to process values from other sensors and you want to perform calculations with these values, for example, please use the Sensor Factory Sensor instead. Set a percentage limit to define when the sensor channel displays a Down status. Please enter an integer value. Default is 50%. Note: This value depends on how many objects you feed into a business process channel. 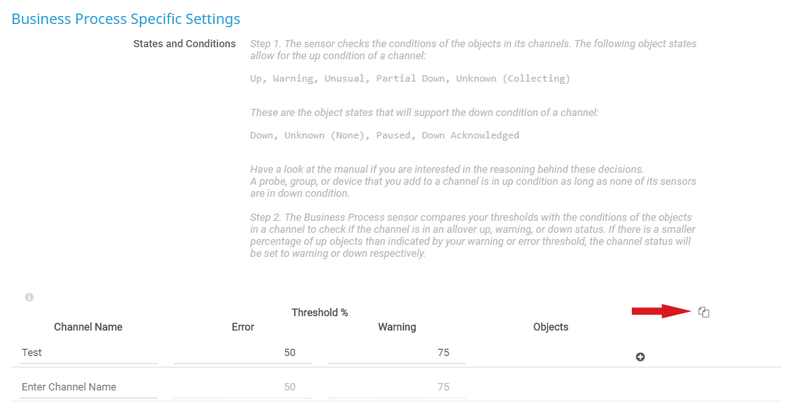 If a channel contains less source objects in "up" condition than the error threshold defines, this channel and the Global State channel of the Business Process sensor will show a Down status (and so the sensor status is Down). All other sensor states will support the "down" condition. To get more information, an illustration of the business process mechanisms and some use cases of the Business Process sensor, see the More section below. Set a percentage limit to define when the sensor channel displays a Warning status. Please enter an integer value. Default is 75%. Note: This value depends on how many objects you feed into a business process channel. You can add sensors, devices, groups, and probes to a channel. Each object you add is weighted equally, no matter if it is a single sensor or a whole device with many sensors. To give more weight to a specific object, add it several times. For example, add it twice to give double weight to an object, add it three times to give triple weight to it. Note: A probe, group, or device is as long in "up" condition as it does not contain any sensors in "down" condition.